A great as traded item in lovely condition. 11-gauge steel frame ensures maximum structural integrity. Each frame receives an elecrostatic powder coat finish to ensure maximum adhesion and durability. Cushions are contoured to a molded frame bringing superior quality and durability. All edges are stitched to eliminate any folds in the material that would limit durability. No set-up adjustments are required, which ensures ultimate ease of use. Easy-to-follow instructions illustrate proper use and muscles trained. Resistance mechanism and pulleys are fully guarded with front and back shrouds. Counter balances enable low starting resistance Specifications. Precision-machined bearing housings provide optimal alignment for smooth, friction-free movement. Hand grips are an extruded thermo rubber compound that is non absorbing, and wear-and-tear resistant. Grips retained with aluminum collars preventing them from slipping during use. All foot platforms are molded rubber with a slip resistant texture. Refurbishment:This is an As Traded item and may have some general wear and tear (nicks, scratches and so on). 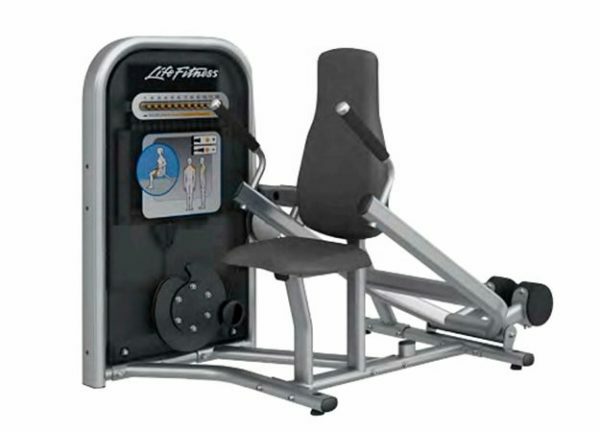 Buy Life Fitness Circuit Series Triceps Press online. If you are interested in the Life Fitness Circuit Series Triceps Press for sale, feel free to enquire above.